SIG Forums are events that the SIGs themselves organize for the conference. This forum offers diverse viewpoints from five different parents raising bilingual or trilingual children in Japan. They will focus on strengthening the parent and child bond through fun and loving language support. Discussion questions will ask about their struggles, successes, and efforts to keep language learning a fun and positive experience for parents and children. The forum will also cover issues such as public vs. private daycare, the challenge of adding a third language, budgeting for extra costs of bilingualism, sibling dynamics, biliteracy, extended family relationships, and use of technology. Forum participants are all English Language lecturers living in Japan and teaching their children Japanese and English, with one participant adding Dutch and another adding Spanish. This will be a collaborative dialogue around questions that matter: What kind of teaching activities do you use and why? How do you introduce business knowledge into the classroom? The World Café method enables movement from one conversation to the next, supported by experienced facilitators, building new dynamic ideas through collaborative conversations. (1) World Café on Money: A forum on teaching money in the business classroom. Money is the engine that turns the world, yet, beyond some cursory accounting or a glimpse at a financial statement, money is rarely addressed in business textbooks. After a short presentation on using stock market apps as a way to connect money to current events, participants will interact to share their ideas on teaching money. (2) World Café on Cross-cultural Communication: A forum on teaching and exploring intercultural competence in the business classroom. Culture is much more that the hard concepts of race or nationality, as seen in such concepts such as corporate or organisational culture, even down to a "personal culture". After a short presentation on cultural relativity, participants will share their own personal cultural insights and share activities that develop student’s cultural competence. This CEFR&LP SIG Forum will address the recent discussion on the CEFR and CEFR/CV with three presentations. The first presentation gives fresh insights in English language policies and influences of CEFR and CEFR/CV in foreign language teaching in Japan. The second presentation shows two CEFR-related case studies, one on assigning can do descriptors and mapping them for oral communication, the other on language learning histories adapting tools from ELP to classroom teaching. The context of a CLIL and EMI institution and the English language program and curriculum will be explained. The third presentation talks about the results of a Kaken research project addressing the needs of teachers to use the CEFR resources efficiently and further perspectives on developing specialized tools for teachers. The Forum will give first hand, exemplary trends on CEFR-related implementation in Japan. It would be nice to hear and include your experiences with CEFR! Come to the Forum and get involved! The College and University Educators SIG was established in 1993 for "discussion of issues related to the development of language education in Japanese colleges and universities" (CUE Constitution). Higher education teachers from all backgrounds face challenges in their careers, pedagogical pursuits, and workplace situations. To support teachers navigating these complexities, a revised edition of the reference Teaching English at Japanese Universities: A New Handbook (Wadden & Hale, 2019) offers nearly two dozen viewpoints that address current issues, providing practical information and insights on this ever evolving educational sector. CUE has invited several of the authors to share their perspectives on the academic setting, courses, classrooms, and workplace topics. This forum will highlight some of the very latest perspectives on foreign language tertiary education in Japan, so the intent is on sharing that knowledge regardless of whether audience members add this reference book to their professional library. This year's CALL SIG Forum will feature four speakers covering a wide range of topics. Paul Beaufait from the JALT Writers' Peer Support Group (PSG) will discuss how technology in use for collaborative peer readership and academic writer support. Renaud Davies will introduce a free mobile-friendly service called Playposit, an interactive web-based video platform that allows educators to provide formative assessment both inside and outside the classroom. Josh Wilson will provide an overview of the digital language learning product market in 2019 and discuss current market trends on the digital side of the ELL industry. Oliver Rose will introduce the LingoLab website (www.lingolab.live), created in collaboration with Paul Raine, a sentence-building activity that can be played as a synchronous online multiplayer quiz for in-class use, or as an individual homework assignment with results tracking for teachers. Please join us! 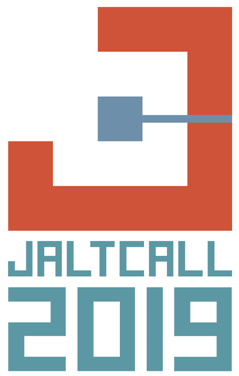 The JALT Critical Thinking SIG will host three presenters for the JALT PanSIG 2019 JALT Critical Thinking SIG Forum. Our forum this year is focused on educating the educator in critical thinking, methodology, and professional development. The forum will start with an introduction to what critical thinking is in the language learning arena and how it can manifest itself. The second portion of the forum will move into more concrete classroom activities teachers can utilize to promote critical thinking development in students. The forum will finish with a critical thinking-focused professional development session for teachers. The goal is to be better acquainted with what the coming changes to the MEXT guidelines means for educators in the University setting. We hope you can join us at our JALT Critical Thinking SIG Forum for an engaging look at critical thinking, the activities that support it, and the expectations that are being put upon us, as educators. The ER SIG will be doing their SIG Forum in conjunction with the Teacher Development SIG Forum. This year’s GALE Forum will address the ways in which equity for all regardless of gender, ethnicity, age, sexual orientation or religion can be fostered in our classrooms and our workplaces. Gwyn Helverson discusses how the roles of women in traditional and modern fairytales, including the gendered roles of AI assistants, can be used in the classroom as content-based materials to develop both awareness of gender roles in society and language skills. Tanja McCandie focuses on the development of a website, equalityeltjapan.net which is addressing the imbalance of presenter demographics in Japan by creating awareness, engaging male allies and supporting female English language educator empowerment. Kathleen Cahill and Brent Simmonds report on the development of the Code of Conduct (CoC) for JALT. The CoC was developed to ensure safety and security for all participants and to provide a friendly environment for all, and they discuss the reporting process in the event an incident occurs. Gerry Yokota provides practical ways in which to respond to unexpected situations or harassment, online and in person, and also ways to foster fundamental gender equity through an understanding of various cognitive issues. The forum will begin with an overview of Global Citizenship (GC) and how it can be integrated into a Model United Nations (MUN). Then a description of various MUN in Japan will be given. Afterwards, findings from a questionnaire comparing KASA (Knowledge/Attitude/Skills/Awareness) and self-efficacy from the first and last conference days from students participating in a 3-5 day National Model United Nations and Japan University English Model United Nations will be shared. Pre-conference preparation for for both conferences, including research, speech and policy making, was for 3-4 months. Following this, similar findings from a KASA questionnaire at the completion of a short 2-day workshop will be shared. Finally, the forum will share results on the development of GC competencies through participation in MUN. Student delegates at the Tsukuba English Model United Nations were asked whether their participation had helped them become more knowledgeable, open-minded, caring, and communicative. Their answers were compared with non-MUN students studying in university global education programs. The GILE forum will provide an opportunity for attendees to learn more about the role MUN can play in developing KASA and GC for EFL students in Japan. Culture, as a theoretical construct that permeates every single human act, is both a fascinating and daunting subject to bring forth in a foreign language classroom. Since the wide acceptance of the 'language is indivisible from culture' truism, foreign language teaching has faced the challenge of bringing this seemingly evident, but infinitely complex topic into the classroom. Although there is a vast array of academic literature exploring the culture/ language relationship, much less has been published about the pedagogical considerations of deconstructing cultural phenomena in a way that can be practically taught to the language learner. In this forum, we intend to tackle these challenges by introducing alternatives of how to incorporate culture into the language classroom in an effective and integrated way as well as a way that has a foundation based on theory. The 2019 Learner Development SIG Forum offers a variety of research and practice-based poster-presentations. In a rotating poster presentation format, presenters and participants will have a chance to share insights about fostering student growth and autonomy. Presentations this year touch upon socio-cultural communicative competence, autonomous goal setting, and student perceptions of their secondary English communication classes.In addition to having a chance to learn about and discuss these issues with presenters, the presentations will be followed by group discussions and reflection to help participants bring ideas to their own classrooms. In this forum, jointly sponsored by the "Lifelong Language Learning" and "Teaching Younger Learners" SIGs, the presenters will speak about the intimate connection between storytelling and lifelong learning. Chiyuki Yanase will discuss how we can share storybooks with young learners in order to develop literacy skills, empathy, self-efficacy, and to foster a love of reading. Nena Nikolic-Hosonaka will demonstrate how the active participation in story time "meaning making" can motivate young learners to develop traits which promote confidence, curiosity, initiative, and divergent thinking. Marybeth Kamibeppu will show how well-chosen storybooks can resonate with readers throughout their lifespan, helping to stimulate discussions about bullying, immigration, and being "the other." Joseph Dias—through his reflections on the books he read as a child, the stories he read to his children, and the results of a survey on the storytelling by parents of bi/multilingual children—will speak about the potential of storybooks for lifelong development as language learners and as human beings. After the talks, participants will circulate around 10 "reading stations," hearing favorite storybooks read by some invited guests. Readings will be followed by discussions on what the story has meant in their lives and in the lives of their children/students. The most commonly asked question regarding literature in language teaching regards what texts can be used with language students, and we address this directly in this PanSIG Literature in Language Teaching (LiLT) Forum. Presenters explain texts they have used in their language classes, their criteria for choosing texts, and the activities they used in classes. We consider issues such as dealing with mixed-level classes, learner autonomy, authenticity and creativity. Presenters talk about their varied teaching settings, including Spanish as a Foreign Language and Japanese as a Foreign Language, in addition to English as a Foreign Language classes. Following this we invite forum participants and attendees to discuss their own experiences and ideas regarding text selection and use. This LILT SIG Forum is friendly and inclusive, and welcomes not just LILT SIG members, but attendance and participation of non-members too. We will have three short (20 minute) talks on a range of topics related to neuroscience and learning. The talks will be concurrent and given to small groups. You will be able to listen to all three talks and feel free to ask questions and discuss with the presenters in this more intimate and interactive setting. Caroline Handley will talk about neurodiversity. Glenn Magee will explain the Matthew effect on children learning to read. Steve Jugovic discuss health awareness topics that support student learning/lifelong learning, and memory. Members of the editorial team will also introduce our monthly Think Tank online magazines. We will finish with a Q & A session on any questions participants have which are related to neuroscience, psychology, and education, as well as to the BRAIN SIG itself. Learn to create learning materials from three MAVR platforms. In this hands on workshop, we will learn to use three MAVR related applications from three MAVR experts. The first is creating simple 360 tours with Storyspheres, a platform for creating interactive VR content with 360 photos. The second application introduced is WallaMe, an augmented reality platform to hide digital messages in the real word. The third application is ARienation, a platform that allows students to connect digital contents to playing cards. Participants of this MAVR forum will hear introductory tutorials of each of these three applications from three different presenters. After these short tutorials participants will be able to learn deeper on the apps they prefer in break-out sessions. The goal is to provide beginner level participants the tools and some experience to get started creating with MAVR. Some devices will be on hand to use, but to get the most of the session please visit MAVR.SITE and download the applications to your own devices before coming. Other Language Educators (OLE) Forum - Allophone Students: Who are They? This forum aims to introduce the term "allophone learners", which is currently not used in Japan. However, the abundant literature that has been available for more than a decade in other countries, such as Canada or France, can be insightful for language teachers and policymakers alike, considering the new immigration policies recently introduced by the Japanese government. The presenters will discuss the current state of multi- and plurilingualism in Japan. Special attention will be paid to the existing support system and opportunities for students whose home language is different from Japanese. This will require that we look at the support offered at different levels of the educational system to such students and also to working adult learners. The presenters will also discuss the similarities and differences between the allophone students in Japan and in other counties where migration is high. As some countries are well ahead of Japan in supporting allophone learners, their example can be useful in the Japanese context as well. The audience will also have the chance to share their views and experiences in this field. This forum focuses on the ways that an organization can communicate effectively with its members. One of the latest approaches for the Pragmatics SIG has been conducting podcasts of interviews of its members about a variety of topics. This provides a means that SIG members and those interested in the field can gain new information and new insights through a whole new format. An actual podcast recording covering several topics tied to Pragmatics--Conversation Analysis, Discourse Analysis, World Englishes, English as a Lingua Franca (ELF) and addressing accents--will be made during the forum so that participants will be able to see the wheels of our network in motion. It is hoped that everyone can gain some valuable tips in what they can do for themselves. The Speech, Drama, & Debate (SD&D) SIG forum will feature consecutive pecha-kucha™ presentations on several topics related to performance-assisted learning (PAL). More specifically, this year's forum includes presentations on (1) sparking students' motivation through drama (Bussinguer-Khavari), (2) co-constructing learning through 'teacher in role' (Kawakami), (3) reviewing an ongoing nation-wide research project on Performance in Education (Kluge), (4) creating role-play cards that increase student awareness (Rathore), and (5) making reading fun with PAL (Rees). The forum will also provide a venue for sharing ideas and discussing ways to incorporate performance-assisted activities into the foreign language curriculum. There will be a short question and answer (Q&A) session following each individual presentation, with a longer Q&A / discussion session once all presentations have been given. In this forum, we will outline the importance of 'Emotional Quotient' (EQ) to develop globally-orientated students, equipped for successful study abroad. EQ, commonly termed 'soft skills' involves communicative competency, people skills, emotional maturity and leadership qualities. Due to the value of these skills in facing study abroad, and ongoing adult development, we prefer to term these as EQ. We will discuss how EQ can be enhanced in the classroom, once students are overseas, and further studies upon return to Japan. This practical workshop is aimed at teachers who are new to, or unfamiliar with, task-based language teaching. It is also for more experienced teachers who may wish to improve their practice of TBLT in the classroom, and those who seek ideas on how to make a strong case for communicative teaching to colleagues and staff. The speaker, himself an experienced TBLT practitioner and materials writer, will clarify the definition of "task", outline the major principles of the approach, present a clear argument for the necessity of a TBLT component across all four main language skills, and demonstrate how to select, constrain, sequence, and assess tasks by presenting lesson ideas and actual examples from the classroom. Participants will leave the workshop with several practical lesson ideas that can be applied with minimal preparation in their next class, and a strong urge to join the Task-Based Learning SIG. 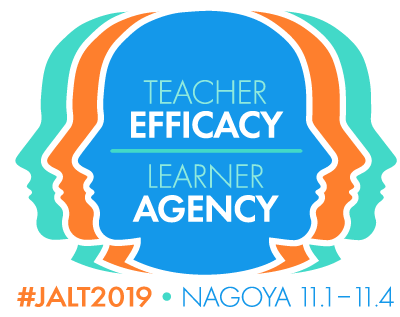 JALT’s forthcoming national conference this year will partly consider the broad theme of teacher efficacy. Yet, what does this term mean, and how can it be explored and approached across the many special interests in our field? In this forum, three Teacher Development SIG officers will each conduct a 20-minute interview with invited representatives from the BRAIN, ER, and TEVAL SIGs, in order to collaboratively and dialogically explore this topic with one another. It is hoped that through formal interaction, SIGs can not only cooperatively construct a richer understanding of teacher efficacy from multiple perspectives, but also strengthen an awareness and find commonalities in the activities of each other’s groups. The forum will conclude with exchanges between the invited SIG representatives on the emergent themes of the session, supported and guided by audience input and questions. Teachers Helping Teachers (THT) SIG volunteers conduct workshops and teacher training programs with affiliates or partner institutions in Laos, Vietnam, Kyrgyzstan, Bangladesh, Nepal and most recently, the Philippines. Interested participants are invited to this forum to better understand our programs, ask questions about participating, and meet participants and country coordinators. All are welcome. TYL SIG will not be holding a forum at PanSIG 2019. TEVAL will not be holding a forum at PanSIG 2019. Teaching language patterns that are characteristic of academic writing and presentations in specialized disciplines can be a serious challenge for language instructors. Many instructors will not have the relevant background to know what language patterns are preferred within and across specialized disciplines or what variations in language use might exist. Also, they may struggle to find relevant teaching materials, as published textbooks on writing and presentation are likely to cater for a wide, diverse audience of learners and thus ignore the idiosyncrasies of particular disciplines. This workshop aims to provide participants with a useful set of tools and a clear set of principles by which they can collect relevant discipline-specific language data, analyze that data to identify characteristic language patterns, and introduce those patterns and the methods of analysis to learners in the classroom. As part of the workshop, participants will learn how to use the new AntCorGen automatic discipline-specific corpus generation tool (Anthony, 2018) and address some of its limitations through the use of other data-collection tools. The workshop will also provide a clear, practical demonstration of in-class discipline-specific language teaching with a focus on academic writing for scientists and engineers.